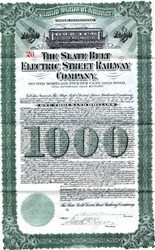 Beautifully engraved uncancelled Gold Bond certificate from the Slate Belt Electric Street Railway Company issued in 1912. This historic document was printed by the Beni D. Benson & Son Lithographers and has an ornate border around it with a vignette of an electric trolly car. This item has the hand signed signatures of the Company�s President, and Secretary, and is over 99 years old. 59 coupons attached on right side.